Betsoft Gaming is inviting players to forge their way through deep undergrowth to discover a world of uncharted wealth and wonder in Faerie Spells. Here, players find the darker face of traditional fairytales: woodland spirits lurk in the shade, will o' the wisps flit between shafts of light, and wild, green-bearded tree guardians stand watch over a secret kingdom shielded from the world by magic. In this shadowy realm, Faeries are royalty. Alongside symbols like glowing, magical trees, every reel is packed with pixie princesses of different orders, as well as their crowns and sceptres. Above them all sits the Faerie Queen, who wields absolute power over all the flora and fauna, turning over toadstools to reveal long-hidden hexes that can multiply your current stake for sudden wins. The Faerie Queen also holds the keys to the hidden workshop where new spells are forever being concocted to fulfil people’s wildest desires. When three or more Queens appear on-screen at once, players are ushered through the leaves and into the royal laboratory, where tubes and vials have been set up to collect ingredients as they cascade down from the top of the screen. 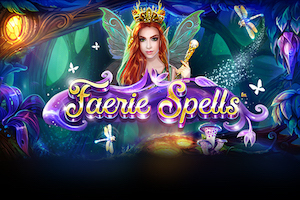 Powered by Betsoft's exclusive Trail System, the micro-scale world of Faerie Spells is home to potentially massive jackpots. Seated at the Faerie Queen's workbench for up to 25 free spins, players collect droplets that contribute to one of four potion recipes: Riches, Wealth, Luxury, and Plenty. When a drop falls into the right container it counts towards completion of that spell, its symbol is removed from the reels, and others cascade down in a magical shower. The magic of Faerie Spells also extends to other areas of the Betsoft portfolio. The value of each tiered jackpot is built up by players of this and other Betsoft games, creating more opportunities for life-changing wins by sharing the same prize pots between different dimensions.